Do I have to use Stripe to process credit cards? You are not restricted by HouseCall to use our integrated processor to process credit cards. We offer credit card processing as a convenience to our customers. We've partnered with Stripe for processing credit card payments. Accept credit card payments for one low rate across all card types and amounts. Stripe disbursements usually take 1-2 business days to reach your account. However, if it is the first disbursement, it can take up to 5-7 business days to reach your account. Stripe is the industry leader for processing payments and uses bank level security. All cards processed through HouseCall Pro and Stripe are encrypted on disk with AES-256. The decryption keys are stored on a separate device. This means that as soon as a customer's card is scanned using the HouseCall Pro mobile app or input into the HouseCall Pro Web Portal, it is secured and unretrievable by the user. If you would like to continue using your current processor, here are the steps to enter the payment in HouseCall. 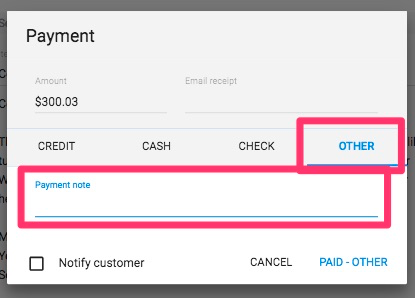 In the payment screen (app or website) select the payment method as 'OTHER'. We suggest using the payment note to indicate where and or how the payment was received. You cannot use the credit card option in our system if you do not want to use our processor.